This is one hard-working band. If you look at the release frequency of their albums, on two occasions they released albums two years is a row. For some bands it might water down their artistic ability, but with Revocation they keep getting better. Deathless, which has been out a couple of months now is a delightful dose of the best things about the fusion between thrash and death metal built on a very technical foundation. 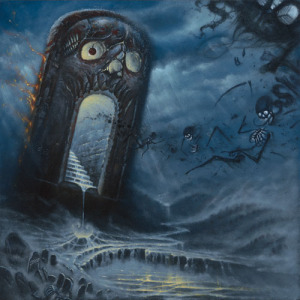 Their complexity is one of the many reasons Revocation is so damn good. They have the groove without being over simplified and balance out their death metal influences with enough technicality to give progressive metal bands that like to show off a run for their money. Deathless is as good of a start as any if you haven’t found the time to dabble in Revocation. There were a lot of metal releases this year, so I completely understand. But, December (right now) is slow; now is the time to absorb the splendor that is Revocation. With songs like A Debt Owed to the Grave, The Fix, and especially Madness Opus, you will be instantly hooked and very tempted to toss chairs across the room. This is a good thing. But, the aggressive nature isn’t the best part. Mixed in with those brutal rhythms are remarkable guitar solos and captivating melodies. Throw multiple layers of growling vocal pitch and Revocation has more depth than your average band. Scorched Earth Policy leans more of their trash style with a guitar solo reminiscent of something you might hear on Megadeth’s Rust in Peace; very speedy, melodic, and lengthy. Apex is a killer instrumental and if it were not for the fact that I already did list of my favorite instrumentals of all-time earlier this year; it would have been on that list had I done it today. I think you get the picture. Depth is the key here and Revocation is full of it. These guys are on fire; they can string some serious headbanging harmonies and a moment later kick your teeth in then make it all nice with an excellent guitar solo. If you want it, Revocation has it. Posted on December 3, 2014, in Album Reviews and tagged David Davidson, Death Metal, Deathless, Progressive, Revocation, Technical Metal, Thrash Metal. Bookmark the permalink. 1 Comment.